STOCKTON, Calif.- For a fourth straight game, the Stockton Ports scored in the bottom of the first inning. For a third straight contest, however, it was the Rancho Cucamonga Quakes overcoming an early deficit to send Stockton to a loss. 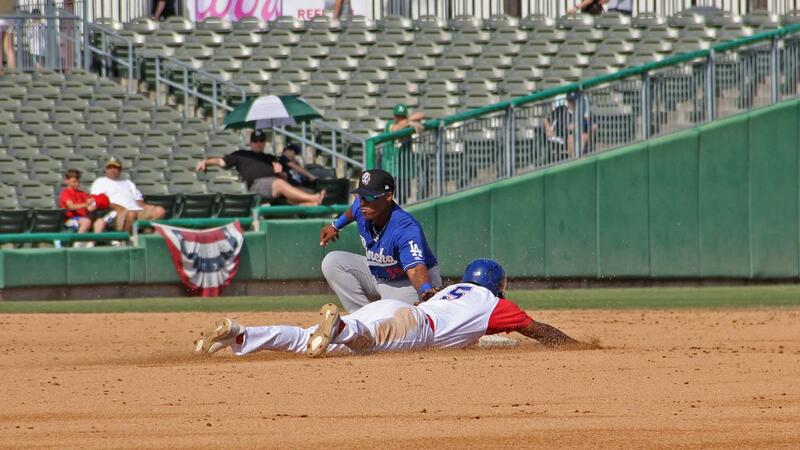 The Quakes scored five unanswered runs after the Ports plated the first two on Sunday at Banner Island Ballpark as Stockton fell by a final of 5-2, their third consecutive loss following their Opening Night victory on Thursday. Stockton's offense got off to a fast start in the bottom of the first inning as the Ports loaded the bases with one out and scored the first run of the game on a fielder's choice groundout by Jeremy Eierman. Trace Loehr followed with an infield single to drive in a second run and give the Ports a 2-0 advantage. Ports starter Wyatt Marks (0-1) gave up a leadoff double to Carlos Rincon in the second inning and then issued three straight walks, the third one bringing in a run to cut the Ports lead to 2-1. Marks, though, would get back-to-back unproductive outs followed by the third out of the inning to limit the damage and preserve the lead. After setting the side down in order in the third, Marks surrendered a leadoff walk to Marcus Chiu to open the fourth inning followed by a two-run homer to Donovan Casey that scored Chiu and gave the Quakes the lead for good at 3-2. Davin Mann followed and doubled to the left field wall and would go on to score two batters later on an RBI groundout by Brandon Montgomery to widen the Quakes lead to 4-2. With two outs, Jeren Kendall walked, stole second and scored on a double by Jeter Downs to make it a 5-2 contest. The Downs double knocked Marks from the contest as the right-hander would suffer the loss in his season debut, going 3 2/3 innings and allowing five runs on four hits while matching a career-high with five walks allowed. Stockton's bullpen, a combination of Jesus Zambrano, Trey Cochran-Gill and Nick Highberger, combined for 5 1/3 innings of scoreless relief and allowed just two hits the remainder of the contest. Quakes starter Gerardo Carrillo would not factor into the decision after going four-plus innings and allowing two runs on three hits while walking three and striking out three. Sven Schueller (1-0) took over for Carrillo in the fifth and would pitch two scoreless innings in relief, escaping a bases-loaded one-out jam unscathed in the sixth. Schueller would pick up the victory in the contest. Logan Salow came on to work the seventh and would work 1 2/3 innings of scoreless relief, working around a leadoff single and a one-out walk in the seventh. Ryan Moseley (SV, 2) pitch the final inning-and-a-third and worked around a two-out walk in the ninth to earn his second save of the series. The Ports continue their homestand on Monday night as they welcome the San Jose Giants to Banner Island Ballpark. Right-hander Xavier Altamirano (0-0, 0.00 ERA) makes the start for Stockton, opposed by San Jose right-hander Aaron Phillips (0-0, 0.00 ERA), who makes his California League debut. First pitch is set for 7:10 p.m. PDT.